Google Translator for Skype is a fast translation add-on for Skype. It allows you to chat with a friend in your native language. Google Translator for Skype lets you translate your chat messages in around 20 languages. 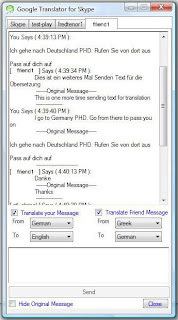 This addon works by translating your messages to your friend’s language and vice versa. It opens a separate window that contains your contact list with an option to chat with the contacts. You can chat with multiple people by opening separate tabs in the translator window. Once the chat tab is open, you can select whether you want the translator to translate your messages or not. It also enables you to decide whether you want to receive translated or plain messages from your friend. Along with the translated messages it will also display the original message in your window.